The above quote by the noted economist Alan Blinder is a testimonial of the significance of inventory management. For businesses of any size, there should be an optimal inventory. If you have an excess inventory, you will end up selling your products at discounted rates and having a lack of free space in your warehouse. But, if you don't have enough stock in your inventory, your consumers will turn away. You may lose several loyal customers leading to severe loss of business revenue. So, many businesses have now turned towards inventory management tools to have an improved inventory round the year. A PDF-417 barcode is a 2D barcode having a capacity to hold a vast amount of data within a small space. It demands only a single scan from a scanner for accurately capturing all data. Invented more than two decades ago, the barcode has become an ISO standard in 2000. The barcode has found widespread application in labeling of hazardous materials, storage of technical specifications, and for encoding of fingerprints as well as photographs on driving licenses and boarding passes. PDF-417 can tolerate damage due to a harsh environment without experiencing any data loss. It has an error-correction technique. How businesses depend on barcodes for inventory management? Inventory management has always been a challenging task for business owners. While many have shown a heavy reliance on various types of barcodes including PDF-417, others have chosen RFID tags. Only a few now rely on excel sheets to quickly identify their stocks that are in their inventory or need to be dispatched. Barcodes are also scannable by mobile scanners. This makes it easier to scan them and retrieve the information as per the requirement. Thus, processing of inventory becomes fast. In absence of barcodes, there is wastage of time in finding a particular stock. Also, you can easily make use of a barcode generator software to create barcodes for your product labels, but these can prove useless if there are no accurate barcode scanning apps to read the information. A PDF-417 barcode scanning app excels in the accurate scanning of widely used PDF-417 barcodes in an affordable way. 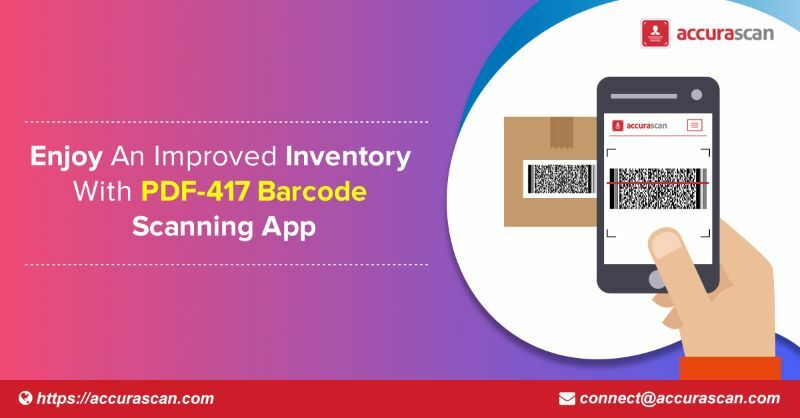 Accurascan developed by Singapore based Accura Technolabs is one such PDF-417 barcode scanning app that lets you enjoy an improved inventory with its accurate scanning in an offline mode. This proves advantageous because anyway it is an expensive affair to maintain consistent Wi-Fi connectivity within a warehouse.